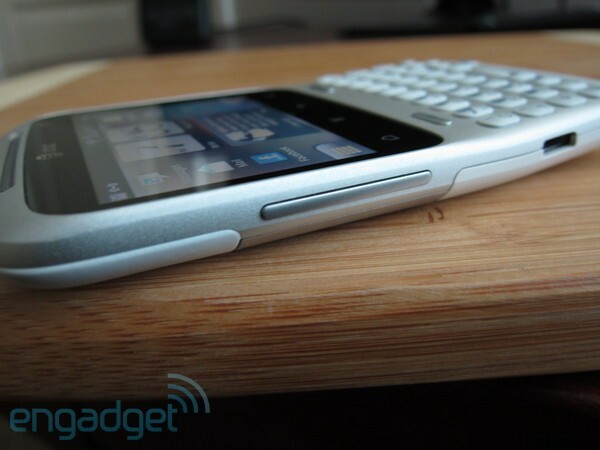 For many smartphone users, a quality keyboard is the only feature that truly matters. These passionate devotees will proudly live and die with their thumbs blazing, and for of all RIM's recent troubles, it's currently floating on a life preserver: a compelling handset with a portrait QWERTY keyboard doesn't exist for Android. The HTC Status ($50 on contract) attempts to succeed where others have failed, and -- if it's any good -- could entice many BlackBerry-toting teens that want a new handheld fixation. They rarely bother with email, as text messages and Facebook reign supreme for communication. To that end, the Status promotes itself as the perfect phone for Facebook users, but is the integration truly useful, or simply a chintzy add-on? 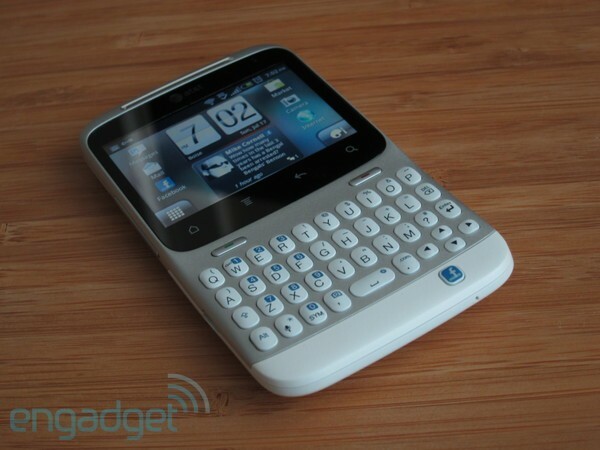 More so, can HTC successfully marry Gingerbread with an upright keyboard? Join us after the break to learn whether we "Like" the HTC Status. While the Status can be fun and offers a quality keyboard, the software makes typing a pain. 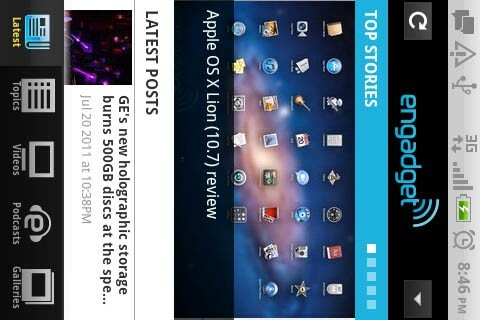 What's more, several apps don't display correctly on that tiny screen. 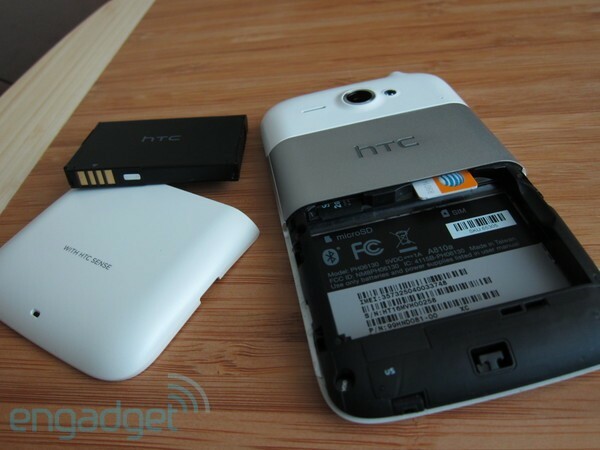 The HTC Status has a form factor you know well. Measuring 4.5 inches (114.4mm) tall and 2.54 inches (64.6mm) wide, it's a touch larger than your run-of-the-mill 9700 or E73, but at 0.42 inches (10.7mm) narrow, it's thin where it counts. Like the Nexus S, it has a gentle curve -- or bend, depending on how you look at it -- a design quirk that tilts the screen ever-so-slightly toward the user. At 4.37 ounces (124g), it's relatively light, although we immediately noticed that the weight isn't well-balanced, as the top half is appreciably heavier. Fortunately, it felt very comfortable when held securely. On the inside, the Status packs a Qualcomm MSM7227 Turbo SoC with an 800MHz CPU and an Adreno 200 GPU. It supports quadband GSM and features HSPA connectivity over the 850 / 1900MHz bands. There's a wide assortment of goodies here, including 512MB of memory, WiFi (up to 802.11n), mobile hotspot functionality, Bluetooth 3.0, AGPS, and FM radio, along with a compass, accelerometer, and proximity and ambient light sensors. Users will find a 2GB microSD card pre-installed, but much to our frustration, the expansion slot is buried beneath the anemic 1250mAh battery. 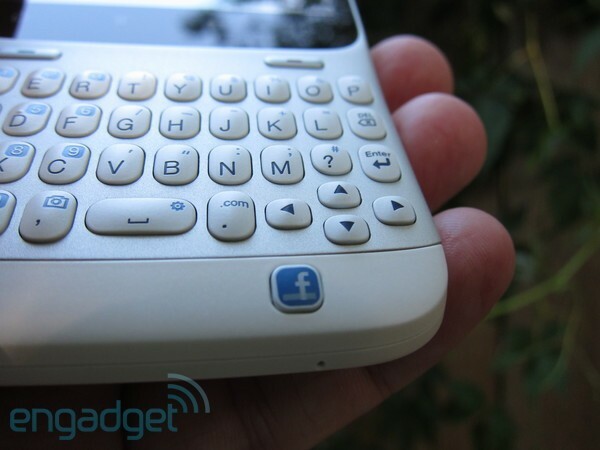 The first thing you'll notice is the full QWERTY keyboard stretching across the bottom half of the handset -- that and the dedicated Facebook button, which we'll talk about more in a bit. 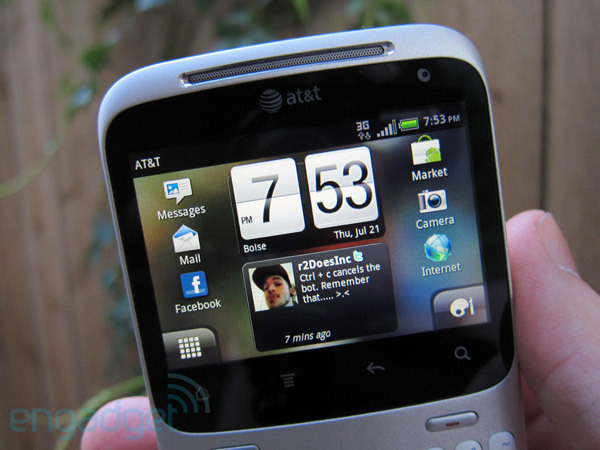 In many ways, the Status takes its design cues from the HTC Flyer. The face of the phone is largely blanketed in a metallic silver coating, save for the chrome speaker grille up top, a curved white strip along the bottom, and a thick black bezel surrounding the display, which contains four haptic navigation buttons. The silvery finish extends around the back to form a broad strip that showcases an engraved HTC logo and separates the camera pod from the battery cover. Sandwich the phone face-down between your palms, squeeze tightly, then push forward without abandon -- the cacophony of key tones is normal, so don't be scared -- just keep forcing it until that damn securely-engineered cover pops free. Hidden within the chrome speaker grille, you'll discover a green / amber notification light that indicates new messages or a low battery, and there's also a front-facing VGA camera nestled in the bezel. Along the left side of the phone is a short, narrow volume rocker that runs nearly flush with the phone, and while you can press nearly any part of the button to adjust the volume, the rocker feels stiff, with poor tactile feedback. Below that you'll find an exposed micro-USB port. A 3.5mm stereo mini-jack is located up top, positioned to the left of the power / lock button. Around back, a 5 megapixel autofocus camera is paired with an LED flash and a dedicated loudspeaker. The 2.6-inch (480 x 320) Gorilla Glass touchscreen features approximately 221 pixels per inch. While this is a step below the norm, we still found all but the smallest of text to be quite readable (albeit, marginally blurry). The TFT LCD screen is decently bright, which allowed us to comfortably view the display in direct sunlight. Granted, it wasn't ideal, but we didn't need to run for shade either. While the color saturation diminishes when angled beyond 20 degrees to the left or right, it's significantly better than the EVO Shift 4G we used for comparison. As for the all-important keyboard, it's quite good. Unlike the never-ending sea of buttons you'll find on the BlackBerry, the Status' island layout allows each domed key to stand separately, and the typing experience is both comfortable and accurate. The buttons are reminiscent of small pebbles, and each key press feels firm and tactile, resulting in a rewarding click. Unfortunately, the underlying panel creates a mushy sound that detracts from an otherwise ideal typing experience. The keyboard integrates a numerical keypad for dialing, along with a dedicated ".com" button and four directional keys that help position the cursor. Provided you're not looking to play graphically demanding games, you'll be pleasantly satisfied with the Status' performance. Seriously, you weren't really planning to on honing your Fruit Ninja skills on the little screen, were you? Sure, its 800MHz CPU is no speed demon, but it's doubtful you'll start begging for an upgrade, either. When it comes to the things this phone was meant to do -- browse the internet, play music, poke through galleries, and yes, update Facebook -- you're likely to have a satisfying experience. Unfortunately, the Quadrant benchmark software wasn't able to complete the requisite CPU test, but we've got a host of other benchmarks for your careful scrutiny. 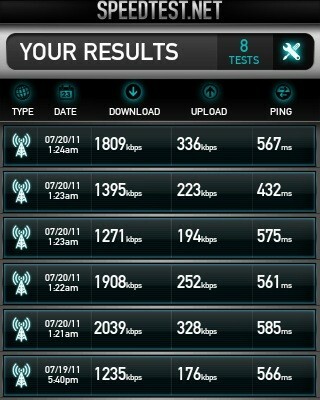 After enjoying outstanding call quality on the Wildfire S -- also on AT&T's network -- we had high hopes for the Status. Unfortunately, those hopes went unfulfilled. While voices sounded clear, an inescapable hiss emanated from the phone as soon as we started a call. Even during calls to landlines, our friends' voices seemed distant, hollow, and muffled. Worse yet, calls would frequently cut out, forcing friends to repeat what was said. Fortunately, no calls were dropped, and our friends perceived us very clearly and seemed quite satisfied with the depth of our voice. Given the small display and relatively pedestrian CPU, we'd hoped the 1250 mAh battery would provide sufficient longevity for web browsing, chatting, check-ins and status updates. Unfortunately, any social-savvy user is likely to overwhelm the lithium-ion cells. One day, we enjoyed an hour of music, and three half-hour blocks of web browsing, Facebook messaging, and good ol' voice chat. During this time, we took approximately a dozen pictures, checked into three establishments via Facebook, and sent a smattering of emails, Facebook status updates, and picture uploads. Ten hours later, we were scrambling for a wall outlet. While the battery will certainly carry you through the day, don't expect it to deliver you through the evening, too. The five megapixel AF camera is an admirable performer under ideal lighting conditions, and is able to capture a respectable amount of detail, especially when coupled with HTC's tap-to-focus feature. Overall, we were quite pleased with the picture quality, but the camera isn't without setbacks. Unfortunately, if you shoot in direct sunlight, even vivid colors will appear somewhat muted, and bright areas will be frequently overexposed. Meanwhile, pictures taken under artificial lighting appear overly saturated, and proper white balance is often difficult to achieve. The camera also produces an appreciable amount of noise indoors, even at low ISO settings. As you might expect, the sensor performs poorly in low light situations, and creates an unnatural (though vaguely artistic) effect of overexposing lit areas while underexposing dark patches. There's no macro shooting mode either, and we found that you'll need at least four inches of distance between the lens and your intended object for the shot to be halfway usable. The LED flash is certainly capable of illuminating an indoor scene, but you'll need to be cautious of reflective surfaces, as the built-in bulb can easily overwhelm the sensor. Video resolution goes up to 720 x 480, and while the frame rate can't properly convey fluid motion at this setting, it should be adequate for capturing embarrassing situations that are bound for Facebook. Much to our delight, the Status comes loaded with Android 2.3.3 (Gingerbread). It also features a customized version of HTC's user environment known as Sense 2.1 for Messenger, which retools the familiar UI for the smaller display. While the main screen is quite crowded, many users will likely appreciate the amount of information and content that's immediately accessible from this panel. Rather than the standard weather widget, you'll find a bubble underneath the clock that displays status updates for Facebook and Twitter. Granted, the usefulness here is debatable, but it's certainly cute given the social nature of the phone. There's only five home screens (rather than HTC's standard seven), and the default panel now occupies the leftmost position. The four remaining spaces include widgets for Google search, FriendStream (which aggregates Facebook and Twitter activity), Facebook chat, and an empty panel with a solitary plus icon that's intended to encourage customization. 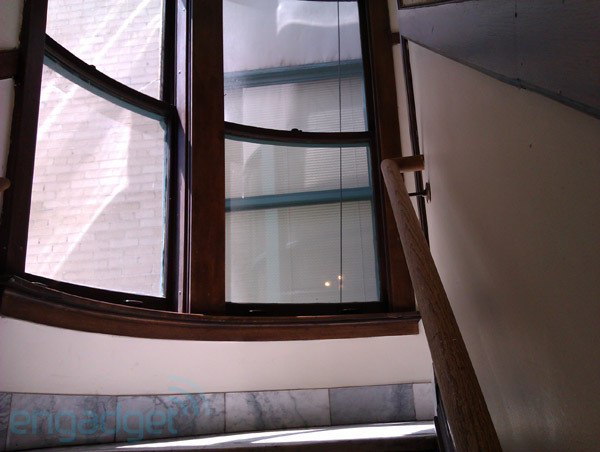 The lock screen is modeled after Sense 3.0, which offers quick access to the dialer, email, camera, and messages by simply dragging the appropriate application onto a ring that's located at the bottom of the display. These icons are also customizable, should you care to replace any with apps of your choosing. Sadly, the notification panel doesn't include the handy Quick Settings menu, which means you must dig through Android's settings to select which radios are enabled. Seeing that the Status is, after all, a social phone, we were consistently frustrated with the typing experience. Mind you, the hardware is excellent -- we're just griping about software here. As writers, we take pride in our words, and unless something is on fire, it's unlikely you'll find us spelling you're as "youre", or who's as "whos." Since smartphones are supposed to be, you know, smart, we shouldn't ever have to type an apostrophe to form a proper contraction. Sure, this can be resolved by enabling prediction, but then we must contend with astonishing "corrections" such as "Boise" being changed to "noise." We have better things to do than keep tabs on word prediction. With a keyboard this good, our typing is deliberate, intentional, and most of all, accurate. Hence, we need a distinct "Auto Correct" mode that's separate from "Auto Predict." All we're asking for is properly formed contractions. Bonus points for capitalized proper nouns. Just don't make us babysit the prediction engine any longer. Our pains didn't end with the keyboard software, either. The camera application routinely quit while taking pictures, and while it brought little fanfare -- returning us straight to the HTC Sense home screen -- it desperately needs a remedy. We also noticed there's a dedicated shortcut to the settings menu that should activate by pressing Alt + Space. Unfortunately, unlike the quick access camera button, this link is broken. Worst of all, third-party applications that don't support rotation will force you to hold the phone sideways to read the content. Initially, this was only a minor annoyance, but it turned out to be a huge inconvenience whenever we needed to enter text. Your only option will be typing sideways or viewing your input in an equally awkward manner. Granted, this isn't necessarily HTC's fault, and should serve as a wake-up call to developers, but it doesn't change the fact that all Status owners will be forced to tolerate this inhumane experience. Of course, no review of the HTC Status would be complete without examining its Facebook integration. Intuitively, many assume that this solitary blue square is merely a dedicated shortcut to the Facebook application. In reality, it's a context-sensitive button that's primarily geared toward sharing status updates and links. By default, a single press opens a dialog for updating your status. (We're sure the pun isn't lost on you). 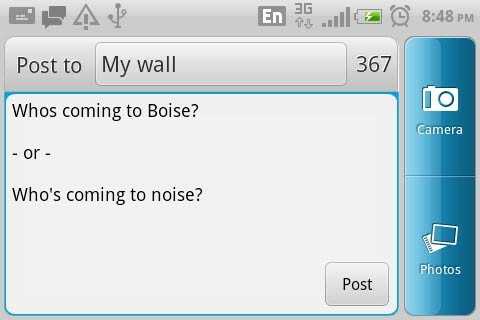 Alternatively, you can write on friend's walls or upload pictures. A long-press on the Facebook button reveals a dialog for checking into nearby establishments, along with the ability to create check-in points for previously unlisted destinations. Tapping the Facebook icon from the web browser allows you to share the article you're viewing -- and provide a thoughtful description, such as: "zomg! LAME!! kthxbai." Sharing pictures directly from the photo gallery works in the same manner, and you can tag friends or provide captions before choosing an album destination. If you're currently a social butterfly who posts updates throughout the day, you might find true value in the Facebook button -- if not, it's unlikely to change your habits. Facebook chat is another primary element of the Status, where a full-screen widget allows you to quickly communicate with other online acquaintances. The instant messaging is incredibly enjoyable to use, and inbound replies were nearly instantaneous. Unless you deliberately sign off, however, you'll appear online and available for chat with friends -- even while you sleep. In other words, even though you'll likely rekindle a few friendships with your new-found availability, you'll probably end up apologizing to just as many contacts that you inadvertently ignored. 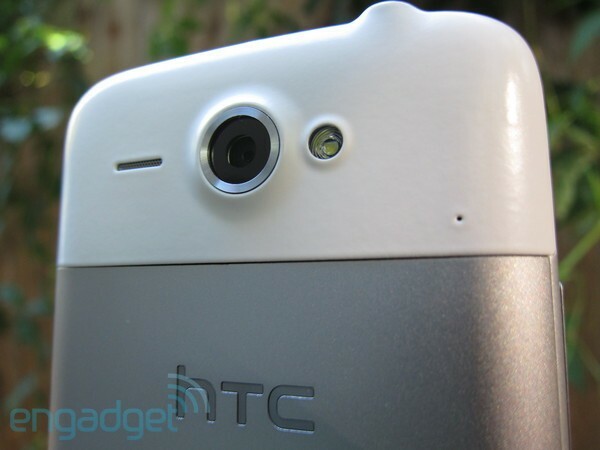 By now it should be obvious that the HTC Status fails to achieve its full potential. Given that it's a device for communication, typing should be flawless, but the software makes it a consistent pain. We hated the battery cover, the battery life is borderline insulting, and there's room for a larger display with greater pixel density, but -- believe it or not -- we'd be willing to forgive these elements if the phone's software felt more polished. We believe HTC will go a long way by simply improving the typing experience, but in order for this form factor to thrive on Android, developers must also rally to support landscape displays in a portrait enclosure. If you're considering the Status as the perfect complement to your Facebook lifestyle, at just $50 on contract, there's still a lot to appreciate. For our part, we're hoping that a better phone is just a software update away.